What if there was an easy way to completely lock down the Intel NUC and give your meeting rooms access to ONLY the applications it needs? What if there was a simple "reset" button to restore your Intel NUC back to the ideal settings and clear any cached files for corporate security compliance? I just wanted to briefly share my successful testing with the Intel UNITE software. Intel UNITE is a free collaboration software from Intel that provides wireless content sharing, file sharing and document annotation over a local area network. UNITE has a open API for developers and looks like a promising collaboration platform for businesses of any size! 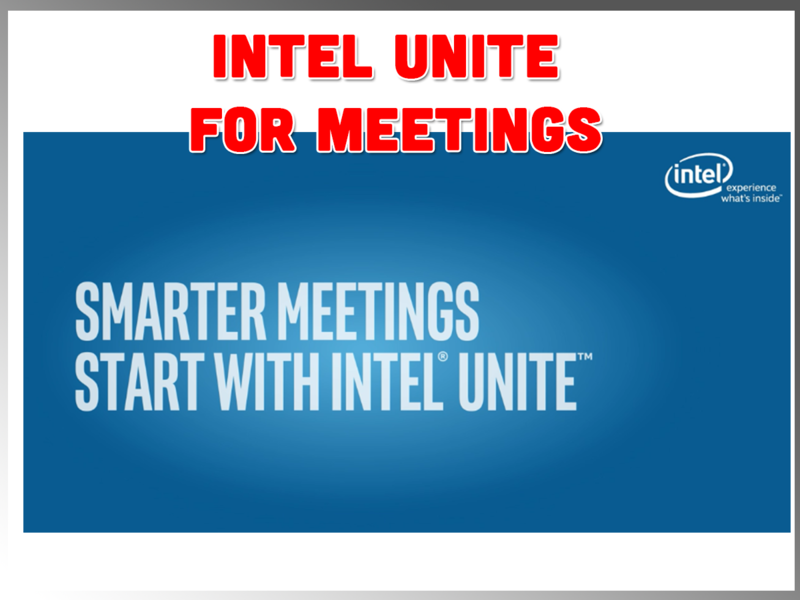 UPDATE 7/6/2016: "I wanted to clarify that our Intel Unite software for meeting spaces will only run on a limited number of mini PC platforms today, all of which feature our Intel Core vPro processors. 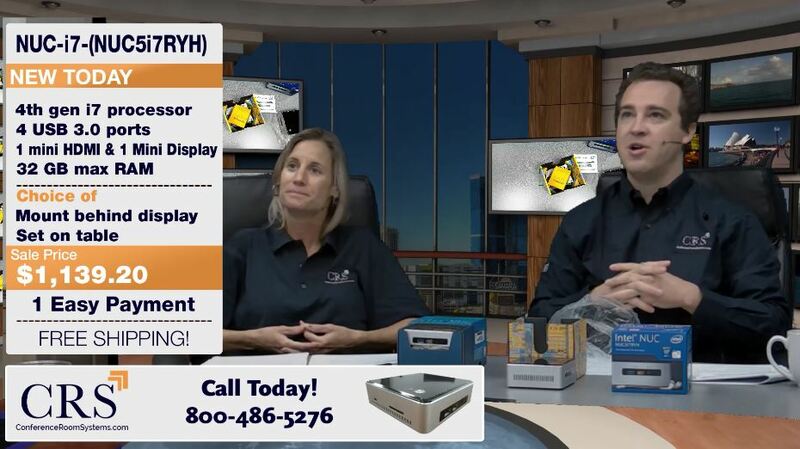 For the Intel NUC product line today, this only includes the Intel NUC Board NUC5i5MYBE and the Intel NUC Kit NUC5i5MYHE, which both feature a 5th gen Intel Core i5 vPro processor. Processors without vPro support, like the ones shown on the CRS posting, are not viable as room solutions running Intel Unite software." Intel UNITE explained and the Intel NUC's to install it on! Hello AV & IT Professional! So if you have heard about Intel UNITE yet we have a crash course ready for you! We go over every Intel NUC "Next Unit of Computing": the Celeron, i3. i5 and i7. Then we go over the Intel UNITE software and how you can lock down Intel NUC's as dedicated appliances, add wireless presentation, collaboration and file sharing for your team. To top it all off Intel has released Intel UNITE as a free software add on to the NUC! UPDATED: 9/27/2016: Intel has just released the 3rd generation of Intel NUC MicroPC computers. CRS is now stocking the i5 model with Product Code: NUC-I5-NUC6I5SYK-H available here: http://www.conferenceroomsystems.com/intel-nuc-i5-p/nuc-i5-nuc6i5syk-h.htm. In the following guide you will learn how to setup Intel UNITE with installation instructions and feature overviews such as annotation, collaboration, file sharing and wireless presentation. We go over all the details of the new Intel UNITE software. In our Intel NUC review we cover the various pre-built Intel NUCs we offer with a choice of: Celeron, i3, i5 or i7 processor. Custom built Intel NUC PCs are great for online collaboration rooms and you can use Intel UNITE software to create a dedicated appliance for users. With Intel UNITE software installed in appliance mode you can give users access only to what they need. With an Intel NUC running UNITE as the “host PC”, you can connect any tablet, Windows or Mac computer for wireless presentation and collaboration. In our live demo we review how the file sharing works along with presenting with multiple users. Enjoy our “choose your own adventure” video series where everyone can learn a little bit more about the new free Intel UNITE software.